I went to the Tesla Model S test drive event today in Fremont. 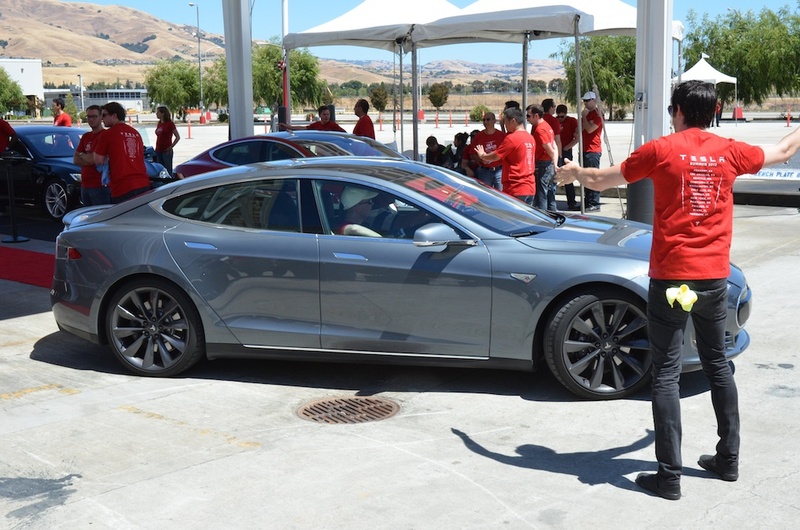 As a Model S reservation holder, I was able to go to the factory tour last November (here’s my pictures and video from that) but this weekend, with the delivery of the first vehicles to customers, this was the first of several drive events being held around the country this summer. The test drive route was a nice mix of private and public roads and highways over about eight minutes. There’s lots of pictures, videos and commentary available on the web already from this weekend but I thought I would add my feedback comparing it to driving my Nissan LEAF (and the Audi A3 3.2 that I used to own). My first impression on pressing the accelerator and turning the wheel was “damn, this thing feels like a tank.” It’s a beautiful, very fast tank, but oh does it feel big and heavy. As a passenger at the ride-along last November, it wasn’t noticeable — because it is so quick and handles very well (even through the slalom course). But when you’re behind the wheel and coming from the likes of smaller cars, you definitely notice the weight and the size. I was disappointed by this. I know it looks big but I had hoped to not be able to really feel it when behind the wheel. Given that the Model S has a much more powerful electric motor than the LEAF, I think part of what I was feeling was how they’ve calibrated the accelerator. (Or perhaps it’s really just the significant amount of mass you’re having to throw around!) I suppose the LEAF’s accelerator is actually a bit touchy. It leaps forward with just a slight press. But then this contributes to the fun and lively feel of driving the LEAF around town. And this despite it’s actually rather poor 0-60 time. Of course, with full torque immediately available and no gears to shift, it is actually very quick at typical city speeds of 0-30/40 mph. 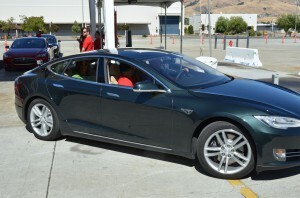 And its small size helps it feel more nimble than something like the Model S. Of course the Model S is flat out faster (must faster than most cars and certainly most sedans) and it actually handles that speed and its weight far better than the LEAF. Unlike the LEAF, it’s definitely engineered for performance. But the Model S is still a big, “executive-styled”, “BMW 7-class series” kind of vehicle and isn’t really my kind of vehicle. So I still have a lot of doubt about following through with a purchase. 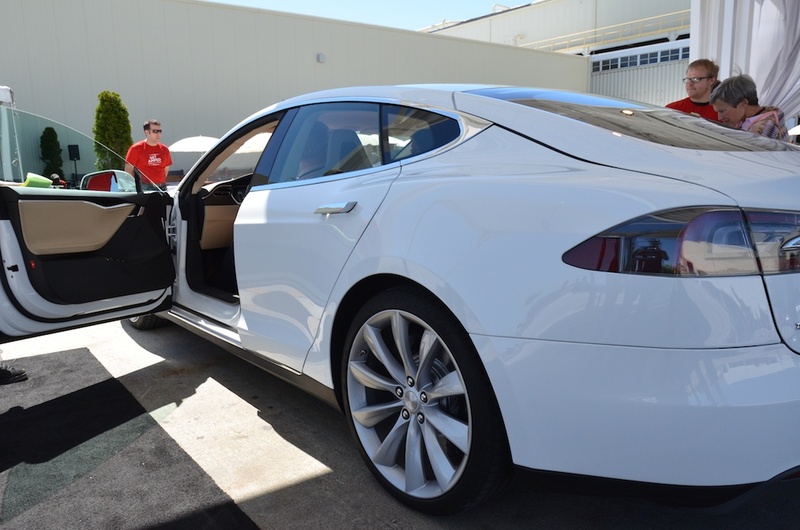 Yes, it is expensive, as Tesla’s business plan is built around the notion of starting on the luxury end and working to bring down costs to develop a more affordable mid-priced electric vehicle. 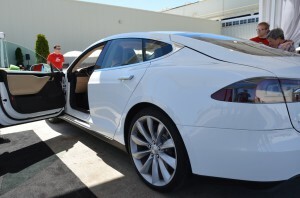 While the expense is understandable – we’re still on the leading early-adopter edge for all electric vehicles, much like cellphones and plasma TVs when they were first brought to market – for this kind of money, I need to really love the vehicle as it is. I’m not canceling my reservation just yet as I’ll probably have until the fall before I have to commit, but what I really want is a smaller, sporty, all wheel drive hatchback – all electric, of course! 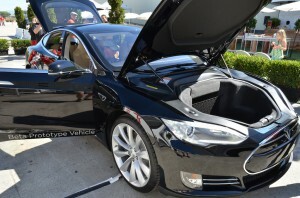 Maybe I’ll have to wait for the third generation Tesla, the supposed Model E. Or maybe somebody else will step up to the plate?